Karl Mohr is experimenting with new one-on-one therapies that employ a sonic voyage and the shifting of acoustic/rhythmic properties to evoke a sense of relaxation and well-being. The experience is of having your own private DJ session, where the "musical" content is a weaving voyage of natural sounds, rhythmic pulses and fixed frequencies with unique healing properties. Tempo variation, sonic textures with qualitative and metaphoric properties, and 'sacred' vibrations are all used, in real-time adjustment for each individual person. The procedure consists of a custom voyage: a vehicle used to explore personal issues, and also to deliver a deep sense of peaceful repose. It began in 2001, with a collaboration between Karl Mohr and Jeffrey Smith, a certified hypnotherapist/NLP practitioner. Together they evolved a CD product which would use modulating ambiences and tempo manipulations to underscore the hypnotic suggestion of Smith's voiceover. This project "Anchoring Self-Confidence" was very successful with his patients and universally effective as a tool for entering a state of deep relaxation. A few years later, Karl Mohr began working with clinical and sport psychologist and jazz percussionist Dr. Ray Mulry who, in the Seventies, coined the term 'Relaxation Therapy' long before it was the well-known wellness buzzword it is today. Mohr had been exposed to Mulry's first cassette series (also named "Relaxation Therapy") when he was only a teenager and one of his first compositions, "Mindmovie" borrowed heavily from the recording. Mohr found Mulry in 2004, and together the pair collaborated on two CD products: "Relaxation Therapy with Dr. Ray" and "Trust Your Swing: The Power of the Pendulum and Rhythmic Flow" - both can be purchased from Ray's web site. In 2009, Mohr started development on his Droid Charge project (now Spannhaken) - this is the loudest, fastest, most complex, craziest music one can experience. But in private parties, the "come-down" segment at the end of the session had a most incredible narcotic effect, taking listeners into deep relaxation or even sleep. Clearly the best part of the mix sessions was the voyage into peaceful, anxiety-free bliss. From machine-core frenetic club music an important key was gleaned to the ultimate chill out: tempo and timbral manipulation combined with monitoring biofeedback for a rich, two-way, one-on-one therapeutic experience. Mohr approaches his audio therapy research as a new branch of healing arts which allows him to employ the sum total of his music, audio and performance training in a controlled environment which requires total empathy, sensitivity and awareness to an individual's needs. After decades of boisterous music expertise, his great gift is to bring people to a state of peace. Who Can Benefit From An Audio Therapy Session? Most people can benefit from a session. Even the chronically-depressed and lethargic will get a lift from this full-system exercise which encourages a healthy state of rest and a stimulated, aware mind. However, those people who will benefit most from relaxing audio therapy are those who are anxious, stressed, over-stimulated and who need a means to properly unwind. Sessions follow physical workouts and periods of exercise very nicely. An active body makes for an active mind; a relaxed body relaxes the mind; a relaxed mind relaxes the body. What Happens In An Audio Therapy Session? Simply stated, the client sits in a comfortable chair with headphones on and small speakers near the head. Sessions are typically one hour in length. Eyes are usually closed; a state of rest - or even sleep - is encouraged. The session continues, with great attention to biorhythmic activity, even if sleep is achieved. A spoken introduction allows the client to focus on his/her breathing and general body state in the first phase. Mohr sits close by, also wearing headphones, using some equipment including a computer to "diffuse" the sonic experience. In the future, Mohr hopes to involve an actual psychotherapy component into the session. For the time being, the focus is on relaxation and inner peace. At the outset of each session, it will be decided if there is any particular issue that needs addressing, whether it can be addressed, how to work with it, or if there is any issue which is sensitive to avoid. Please note: this is primarily a relaxation therapy, not psychotherapy at this time. Serious psychological issues should be addressed by a medical professional. Future interests include the use of bio-feedback monitoring equipment (for breathing, heart-rate and brain activity); for now, simple visual observation and listening to verbal feedback are the only techniques to responding to the client's experiential progress. As the introduction gives way to a client who appears to be in peaceful repose, a check will be confirmed that the client is in the deep state and ready to proceed, then the real sonic voyage begins. The very slow tempos and tones do their work at this stage. A reverse count-up back to regular brings the client out of the deep state and is of similar length to the countdown-descent. If the client has fallen into a deep sleep or state of trance, additional techniques are used to wake him/her. During this experimental stage, sessions are only $40.00 CAD and will involve signing a medical waiver. Due to the ongoing experimental nature of this therapy, a short initial health questionnaire is presented at the start of the session; at the end of the session, a short progress report is filled out after the client has regained a coherent state of consciousness. These documents are for the client's safety and general progress, as well as to help assist the ongoing development of the therapy. Karl Mohr has a BMus degree and has studied at the MMus level in Recording - he is a studied music/audio professional. He has no medical degree nor certificate credentials in therapy. He is developing his own therapies for the well-being of the over-stimulated general population with techniques that have had some success. The term "therapy" often implies a long, ongoing - often costly - process. Here, Mohr is using the term "audio therapy" like "relaxation therapy" or "skin therapy" rather than the more significant outlay of time and energy that "psychotherapy" involves. In these experimental pursuits, he boasts no claims nor guarantees. He welcomes feedback and donations to the development of his therapy but insists that his therapy sessions remain affordable until he has developed reliably as a practitioner. Mohr has had an excellent success rate with leaving clients feeling relaxed and renewed. On the client's side, knowledge or training in music is not required for this process, nor is previous experience with therapy or healing required. The only requirement is to be able to sit in a comfortable chair for one hour and leave the cares of the world behind - not always so easy in our modern world! Previous clients have noted the simple pleasure of "doing nothing" for an hour as one of the basic benefits. Note: this therapy does NOT intentionally involve any type of hypnosis, NLP or cognitive imprinting. Requests for goal-specific hypnosis will be denied. If the client has any concerns, it is highly recommended he/she bring a friend or family member to the session. It is not recommended to eat, especially heavy or high-carbohydrate meals, 1-2 hours before the session. Likewise, taking drugs or alcohol up to 24-hours should be avoided, if medically possible, for full advantage to be taken of this therapy. The goal is to be self-aware and alert and move toward relaxation as an active, aware process as the conscious mind gives way to the subconscious. If you will be in Toronto and wish to book a relaxing one-on-one audio therapy session, please contact studio@multibeat.com or call/txt 416-559-3339. Photography: Omar Mosleh, Ivonka Frankova, Carol Bell. 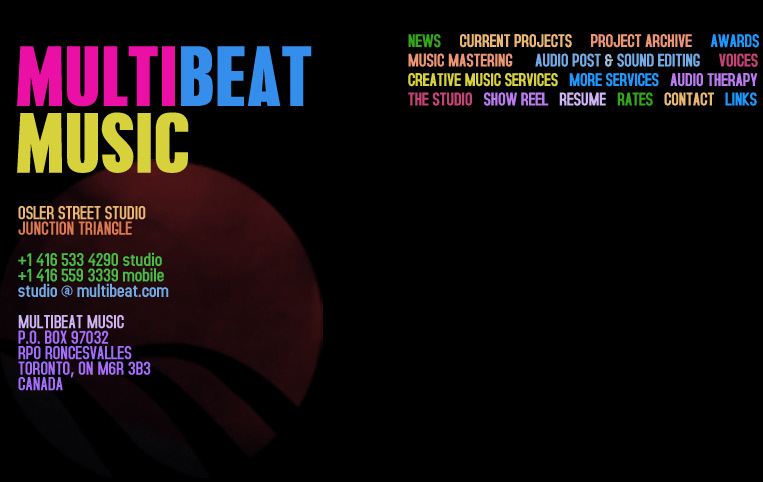 Web site design & content: © 2012 Multibeat.